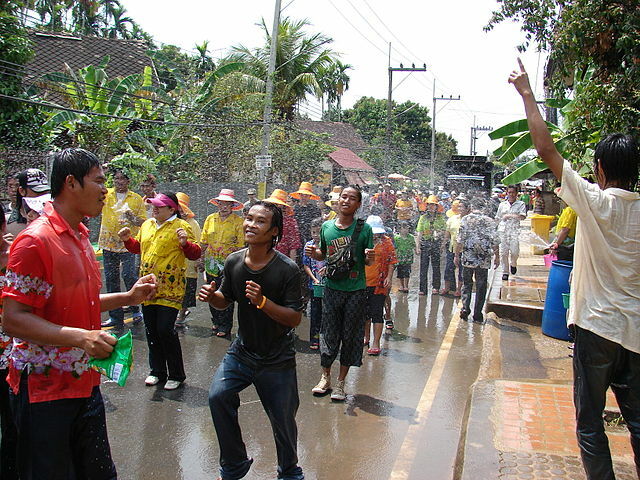 Today is Songkran, the Thai New Year’s day. I’ve lived in Patong for almost ten years now, and I’m always thrilled when Songkran rolls around, not just for the sanuk that goes with the holidays, but also for the water fights. It’s fashionable for long-term expats like me to be a bit blase about the massive partying going on in Patong, but I’ll readily admit that I love it. Thousands of people dousing each other with water. It’s crazy, it’s wild, and it’s one whole heckuvalot of fun. The water fights have just started, and they’ll continue for the next three days. In a few hours, there will be rivers of water rolling through the streets of Patong, with traffic snaking and snarled all through our little town. I’ll hop in a truck with my Dad, stick our friends in the back, set ’em up with barrels and barrels of water, roll out the squirt guns, and go have a blast. For those of you who have written, concerned about the political problems in Bangkok, not to worry – Bangkok is a thousand miles away, both geographically and politically. In Phuket, everything’s normal, always has beenÂ normal, and it’s time to have fun.